The Bare Root Lapins Cherokee cherry tree is a reliable garden favourite. The large cherry fruits are big, dark and sweet. If you only have room for one tree, this would be a great choice. The Lapins Cherokee cherry tree will drop some of the cherries while they are green, this is normal in the World of cherry trees and it probably has a nick name of butter fingers to its tree friends. 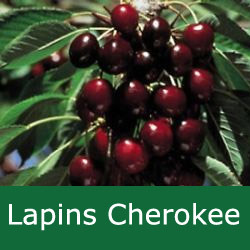 Although the Lapins Cherokee is considered self fertile and will produce cherries without the need of another cherry tree nearby, often the harvest size can be improved by doing just that. Other cherry trees to consider planting nearby include Goodnestone Black, Nutberry Black, Merchant, Newstar, Mumford’s, Black Tartarian, Merton Glory, Merpet, Lapins, Petit Noir, Black Oliver, Bullock’s Heart, Hertford, Celeste, Santina, Sandra Rose, Sonata, Sweetheart and Summer Sun.